The opening sound of reverb becomes wind-like, and it’s within this that one catches first sight of the strings, almost static, one by one becoming tremolandi. Another symmetrical hint of L’ECRAN, perhaps, although these strings are more spritely and gymnastic; after just a dozen bars, a violin and cello break free and launch into dual soliloquys, their fiercely demanding material quickly melding into a duet. It’s not immediately obvious aurally, but Dillon has divided the 12 strings into three groups: the first comprising four violins, the last one each of viola and cello plus two double basses, with a string quartet in the middle. At this early stage of the piece, the three groups, although materially distinct, work together towards a larger tutti texture; already the music contains such fine complexity of tracery that the ear becomes caught between delight and abject disorientation; Dillon wasn’t kidding when he likened it to a “tidal delirium”. Without destroying its detail, the tape and electronics nonetheless cast something of a veil over this tracery, obfuscating points where phrases begin and end; beyond this, the electronics act as a boundary, encompassing the strings and defining their horizon. Pauses in the score allow the electronic layers to expand further, becoming timbrally akin to a vast mechanism that passes quickly by, steamrollering the strings. They’re left barely moving, but in their behaviour lies a ferocity that’s only starting to make itself felt. Another even more lengthy tape episode follows, resembling a richly multifaceted drone (the string texture seemingly continuing in the tape part), before the wind becomes audible again and the strings find their feet. At first blurting, they create a large, hectic network of lines, existing as a single entity but again thoroughly individual in their discrete lines. There’s a momentary hint of something pulse-like, and again shortly after, but regularity is about as far from Introitus as could possibly be imagined (Arnold Whittall once likened the work’s style to “clouds without clocks”). Determination seems to be the order of the day, all the strings impelling their material along through dense cascades of demisemiquavers and soaring glissandi. The electronics often seem to cause subsidence in the strings, ostensibly sapping their energy, but a new kind of equilibrium is found by the central quartet breaking free from the group and becoming the focus of attention, modestly supported below and above by the remaining strings. Meanwhile, in a dramatic shift, the electronics rekindle the ‘mechanism’ from earlier, capturing the strings in its rotation and becoming an epicenter about which they congregate, no longer surrounding but now enclosed within them. As it vanishes from sight, there’s less sense of the strings needing to be forceful, tempting them to occupy higher (less stable and coherent) registers, and back to the kind of powerful tremolandi heard in L’ECRAN. While the electronics remain at bay, the string texture both thins and thickens, flashes of harmonic references glistening past so fast they seem barely credible, and after a final sonic glade, the strings ebb away over trills and a firm final pizzicato note. This is not quite the end though; in the closing moments, the electronics—large yet distant—move very much closer, fascinating new details emerging within as the work ends (the score indicates several minutes of tape solo at the end, but in the context of Nine Rivers it appears to overlap into the final work, Oceanos). The overall interaction between the instrumental and synthetic aspects of Introitus is strikingly effective. But most impressive is Dillon’s string writing, the sheer inventive range of which is exhaustive, and the interrelationship of the three groupings, particularly the long episode where the quartet is in the foreground, is thrilling despite the quietening taking place. An unavoidable caveat is that one can’t help feeling the overabundance of elements and ideas that went into the composition of Introitus (discussed in full in the programme note) are impossible to grasp, and perhaps don’t even lend the work any greater depth from a listening perspective. i’d single out the 444 “periodicity rates” that Dillon procured from astrophysical data concerning pulsars; Dillon’s account of how “these periodic signals were then assigned to a […] an isolated set of 444 ‘cicada’ pulses” derived from a computer-assisted dissection of “a single sound sample of a Mediterranean cicada song” is simply absurd information for the listener; not one iota of that admittedly fascinating compositional process is audible in the resulting composition. This is hardly a complaint, though, as Introitus is too bewilderingly exhilarating for any of that to matter; in any case, such writing as this is to a large extent a product of both its time and, dare i say it (pace Dillon, Dench, Ferneyhough), its compositional subculture. 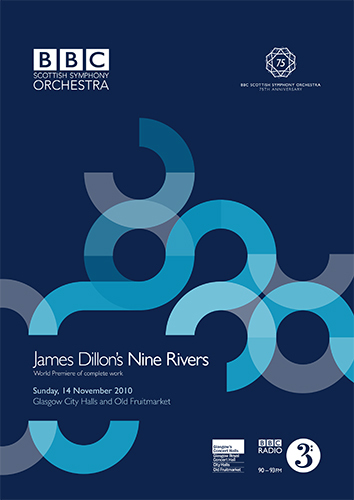 In the Nine Rivers world première, the piece was given a dazzling performance by members of the BBC Scottish Symphony Orchestra (they really ought to form their own contemporary music group), directed by Steven Schick. These interdependent strata function not simply to perform a coherent unity or a symbiosis but cite their own deconstruction. Introitus within the context of Nine Rivers may be viewed as an estuary (L. aestuare, to surge, foam as the tide), a tidal delirium opened up by theemployment of computer technology. Musical material in part either echoes events from previous Nine Rivers works or in common with previous works is constructed around an interaction of prototypical patterns, spirals,branching and meanders, (with turbulence – seebelow) these patterns are identified in morphology theory as lying at the basis of most natural formations. However, the topologies of these patterns in Introitus are redefined as they are plotted along an axis which situates their position somewhere between ‘continuity’ and ‘discontinuity’ – as ‘flow’ or ‘disruption’ – the axis here exists as a set of rules for the union or division of musical material. a) Violin, viola and v’cello samples were recorded at IRCAM and classified into generic taxonomies, according to frequency, attack / decay transients, duration and stability. These were then ordered according to scale which assigned values for pitch, duration and three timbral co-ordinates (Weasel, Winsberg), velocity, spectral flux and brightness. These sound samples are converted into text files for the computer to read and form a reservoir of string sonority from which a large series of complex sound textures are generated. This generation is developed through the iteration of a Feigenbaum algorithm which circumscribes the conceptualities for continuity and discontinuity. Driven at slow speeds this algorithm generates smooth and laminar textures but as the speed is increased these textures divide and break into increasingly turbulent states – the fourth prototypical pattern – an escalating cascade of period doublings therefore metamorphose and propagate the initial periodicities into complex narrative webs of sound – reticulative states. b) A set of pre-recorded natural ‘sound-objects’ from various sources were chosen for both their sonic potential as deconstructs and their symbolic references – here representing the four elements of earth, air, fire and water. These sound objects were also translated into text files for the digital mix program and are filtered and transformed through a concatenation of ‘stretches’ and ‘folds’, emulating so called ‘Smal’s folding’ which poise their structure somewhere between laminate and turbulent states. As objet sonore these function as ‘windows’ or translucent spots within the (above) ‘string maelstrom’. c) Periodicity rates (444 in all) extracted from a 1988 print out from Jodrell Bank of the known (to astrophysics) pulsars – a celestial source of radiation emitted in brief (0.03 second to 0.4 seconds) regular pulses – these periodic signals were then assigned to a distinctly terrestrial sound source, an isolated set of 444 ‘cicada’ pulses – a single sound sample of a Mediterranean cicada song was dissected with the use of a computer analysis program and provided the series of individual pulses. d) A superposition (as moiré pattern) of a series of synthetically generated harmony and inharmonic spectra – banks of oscillators deliriously articulated in a feedback loop of turbulent flow – a spectrum of spectra. The tape was created by employing both IRCAM ‘analysis’ and ‘mix’ programs in combination with a set of specifically created programs for the generation of turbulence. These programs were implemented on the Vax 780 in tandem with the Max / Patcher environment operated on a Mac II. 3) The live electronics introduce a further level of vestigial control and function to confront the idea of ‘symbiosis’, both an overall divisive and unifying force, any dialectic between the two former strata is circumscribed by either a controlled capriciousness or orgiastic blessing. Complex forms of patterning intermittencies, bifurcations etc. (Feigenbaum’s magic numbers) creating turbulence also at this level which is employed to control the live mixing, transformation and diffusion of layers 1 and 2 and maintaining a density of construction to the final moment of performance. An attempt to circumvent any notions of electroacoustic ‘rouge’ – and rediscover the displacements involved in the ‘live electronic hybrid’ is perhaps also an attempt to reinvoke some traumwild. The live electronics employs the Matrix 32 a device developed at IRCAM for the control of audio-signal routing. The live transformation of sound is controlled by the Max / Patcher environment on a Mac II, which allows for an extremely rich and complex networking of interactions and is routed through MIDI effects systems. Introitus was commissioned by IRCAM, Paris; the first performances took place during May 1990 in the Centre Georges Pompidou, Paris and were given by the Ensemble InterContemporain conducted by Peter Eötvös. Introitus was composed for the 65th birthday of Pierre Boulez to whom it is dedicated. Thank you very, very much for posting these. Dillon has perhaps been overshadowed by his colleagues; this concentrated presentation of his work as he intends it reveals a truly astonishing and freakishly idiosyncratic figure, an archetype of the truly great autodidact – an Ives, or a murky and problematic Wagner to Ferneyhough’s urbane and witty Liszt, perhaps? The string writing in this piece, specifically, is categorically different from anything I’ve seen – it is not merely “complex” (“original”, “experimental”, whatever), it is flabbergasting and preposterous (independent double-stopped glissandi in cross-rhythms?) in the very way that would make all but the most enlightened dismiss his work entirely. Extraodinarily committed performers, and an extraordinarily committed composer.